We use and hear the phrase ‘brace yourself’ which is said to have evolved from the verb form of ‘brace’: “To make (a structure) stronger or firmer with wood, iron, or other forms of support”. ‘Brace’ then evolved to “brace yourself” which translates to doing something physically to keep yourself from falling over or being knocked over by some force. Which led to figuratively “bracing yourself” against an emotional force, something difficult, unpleasant or shock. I took this same notion and coined the phrase ‘GRACE YOURSELF’. Which is to make yourself stronger, firmer with the unfailing support of His grace. To bask in His grace which keeps us from falling and prepares us for every aspect of life. How many times have you encountered a massive task, emotional test, huge detour of life and feel like you just can’t face whatever it may be? These are the very moments in which you need to ‘GRACE YOURSELF’ and know that you have been graced for that very thing. ‘You have been graced for this. You are God’s masterpiece and He created you in advance with this beautiful adventure of life in mind. There is nothing too hard for Him and there is nothing too hard for you, once you remain in Him’. His grace allows you to endure and persevere when you rely totally on Him (Proverbs 16:3). His grace keeps you from sin but is not an excuse to intentionally continue in sin (Romans 6-7) Amen! You have been graced for everything that you will encounter in this life. God gives us assignments according to what we can be trusted with, in our present time. Will you be a faithful steward of all that he has graced you for? Can you be trusted with His grace? My ‘GRACED FOR THIS’ testimony is that the outcome of completing a Masters degree and working in a high pressured position both full-time resulted in a Distinction grade thesis due to be published and the best A-Level results that my Sixth Form had ever seen since its inception. God’s grace does not negate hard work. His grace empowers our work. Favours our work. Establishes our work. In modern terms, His grace gives our work a different yé! So, whatever you encounter, please remember that you have been ‘GRACED FOR THIS’. 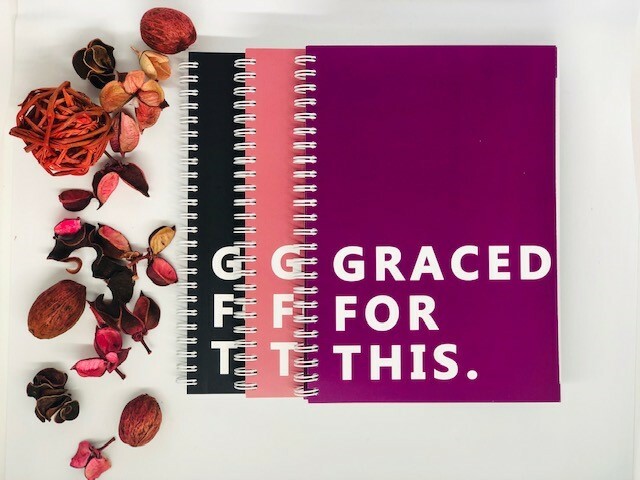 I’ve created ‘GRACE FOR THIS’ journals as a reminder that whatever God calls us to, He gives us grace for it. Even if it seems impossible or beyond our present abilities we have been GRACED FOR THIS. Have a look at my journal collection here. I truly love this as I’ve gone through trials and tribulations, remembering I am graced for this kept and maintained me.